After being selected as one of six competitors in this week's Foodie Fights,* I had a mild panic attack upon finding out the selected ingredients. Battle Cauliflower and Raspberry would not be easy while standing on Thai ground. For starters, the word for raspberry doesn't even exist in the Thai language! And, although cauliflower can be grown here, it isn't a local vegetable but rather a farang vegetable (specifically farmed for foreigners). So, I dreamt up a recipe, loaded my wallet full of Thai baht and began the trek to the closest foreign market in search of two non-local ingredients. Arriving at the market, drenched from the morning's tropical rainstorm, I was surprised to locate the raspberries in the produce section. Shipped from California, they were a bit weathered looking. But, I scooped up the container which boasted 12 berries for a mere $14.76 USD (sarcasm and eye roll intended). While the raspberries pinched the wallet, the cauliflower took on the role of the illusive ingredient. After searching the produce section extensively, I approached the store's manager and in broken Thai language I attempted to ask if there was any of the produce perhaps located elsewhere. At the time, I didn't know the word for cauliflower and had to resort to charades. Somehow I made an impression and I was asked to return in 30 minutes. After a bit of a wait, I was presented with a head of cauliflower about the size of a baseball ($10 USD), which had been put on the back of a motorbike and delivered from another market. I placed the snowy white vegetable next to the berries in my reusable bag and skipped home ready for a morning of cooking. *Update: the votes are in and counted. And, disappointingly, this recipe didn't take the win for battle cauliflower raspberry. However, it is a delicious example of fresh Thai cooking and I highly recommend you give it a try in your kitchen. Cheers to my competitors for a great foodie fight! A satisfying alternative to a salad, these rolls feature fresh zappy ingredients that wake up the mouth. Enjoy as an appetizer or as a light lunch, served with some fresh fruit and a cool beverage. For the dipping sauce-- Place the raspberries, ginger and 1/4 cup of water in a saucepan. Mash the fruit slightly and simmer for three minutes. Remove from the heat and push the liquid through a mesh sieve to remove the seeds and the ginger. Return the liquid to the saucepan and add the honey and lime juice. Over low heat, stir well until the sauce begins to bubble. Remove from the heat and allow to cool completely while you assemble the rolls. Serve cool. For the rolls-- Bring a large pot of water to a boil. Place the cauliflower florets and the carrot slices into the water and cook for 2 minutes. Remove and immediately place into a bowl of ice water. Strain and move vegetables to a plate. Add salt and pepper to taste. Take the cauliflower and cut carefully into strips, discarding any small pieces that crumble. Working with one wrapper at a time, submerge into hot water until pliable, approximately 30 seconds. Place wrapper onto a flat surface and add a pinch of cilantro leaves, bean sprouts, mint leaves, 2 pieces of green onion, 2 pieces of carrot and 3 pieces of cauliflower. 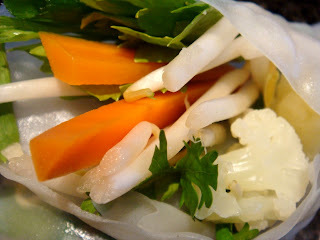 Wrap sides in and then wrap tightly to form a tube around the vegetables. To serve immediately, cut in half and place on platter. To save for up to three days, line a covered storage container with a damp cloth. Layer the rolls with a damp cloth between them, cover and place in the refrigerator. I can taste the mint with the crunch of the cauliflower now. And, that dipping sauce. The color is beautiful. I don't envy your search for cauliflower in Bangkok. I don't believe I ever saw it there either. 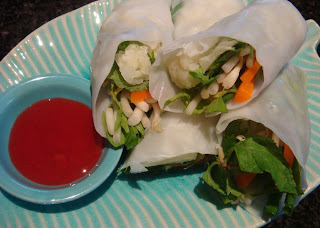 I love spring rolls and I can't wait to try out this recipe. Living in California cauliflower and raspberries are readily available at our farmer’s market. The picture of the spring rolls and the sauce look so good I’ll be shopping tomorrow. All of your recipes are so much fun to try out that I know this one will be a “winner” too. I’ll be voting for your creativity and for the effort it took to get the ingredients. I’m excited to check out the foodie fight web site. I'm excited to try these. I love spring rolls and the addition of a raspberry ginger dipping sauce sounds like it will pair wonderfully. I love this recipe because if you would never have mentioned there was a competition, I wouldn't have thought the inclusion of raspberries and cauliflower odd. I'm hoping someone didn't do a dessert. No matter how creative, cauliflower and dessert don't belong together. Cauliflower ice cream anyone? WTF? Cauliflower and Raspberries? Looks like you were victorious and turned it into something edible (and tasty too). I'll give it a try. Don't be upset if I drop the califlower though. Spring Rolls: so smart. Good luck in the competition! Oh so yummy and fresh looking. Wow. I'm impressed at the level of effort you went to, to get all the ingredients. Really great job. Wow, your experience trying to find raspberries and cauliflower puts my husband's rhubarb hunt to shame! I'm excited that you were chosen for the most recent battle, being my favorite food blogger and all. I've cast my vote and will be trying yet another "Loving Rice Original". Your blog constantly inspires us to chase our dream of relocating. Seeing you successfully do it has led to us schedule a visit to a new Bangkok condo development this coming August! I purposefully save reading your updates until I make it through all the other blogs I read...Must...Save...Best...For...Last. I love your blog. Every time I read your posts I feel like I'm catching up with a best girl friend over a good cup of coffee. It's the kind of conversation that you never want to have end and an hour feels like a minute. Thanks for the inspiration. Can I join you for coffee in person sometime? The previous post says it all. I'm hoping that you compile this all into something I can read on the go. I love your stories. I just found your blog from the foodie fights website and am so happy that I did. Gorgeous photos and such fun stories of the life of an expat mama. Clearly the judges were mistaken. I demand a recount. WTF? I checked the fight site and read the judging remarks. The judge who voted for the salad because it didn't have seeds in it... PUHLEEZE.